Isla Mujeres, 'Island of Women' lies 8 miles across the bay from Cancun, is only 5 miles long and just over ½ a mile wide at its widest point. The west and north sides of the island have several lovely white sandy beaches; the east side is rocky and windswept as it faces the open sea. The island has around 14,000 inhabitants, most of them living in the town at the northern end. Tourists have now discovered the relaxed fishing village of Isla Mujeres, due to the 80°F year-round temperatures, tranquil seas, and beautiful Caribbean atmosphere. Most people who visit Isla Mujeres come across on a ferry or catamaran from Cancun, and most stay only for the day. The island is small, so you can easily digest the atmosphere in a single day. 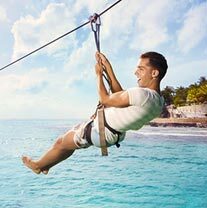 Our Isla Mujeres Tours and Excursions cover a wide range. From all-inclusive tours to snorkeling at Garrafon Ecological Park to simply relaxing on the beach, you'll find it here. Most cruises to Isla Mujeres come with open bar. 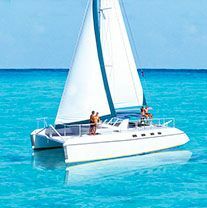 We've teamed with some of the best tour companies in Cancun to offer you a broad spectrum of Isla Mujeres tours.